It's time to announce the annual Belly + Baby Special for 2012. This year we're combining it with a gorgeous new product -- the acrylic block print. 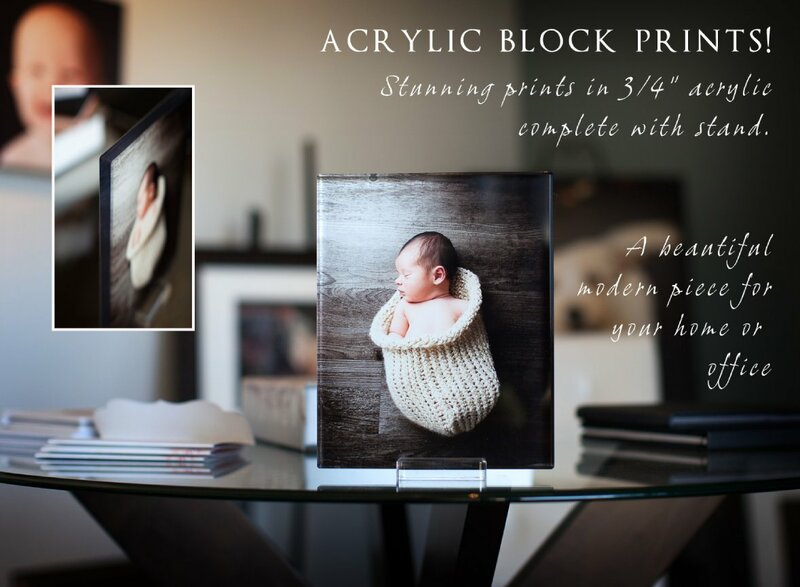 If you sign up for the Belly + Baby special package (a two session package which includes a full maternity photography session and full newborn portrait session for $350) we'll also give you an 8x10 acrylic block print! Stop by the studio to meet us and view samples -- you won't be able to resist your favorite baby portrait done in acrylic. Each print comes with it's own matching stand so there's absolutely nothing else to buy, just unwrap it and prepare to dazzle your friends. To qualify you must sign up and pay for the Belly + Baby package ($350) during the month of July, 2012 and use both sessions before the end of the year. Babies must be photographed before they are 15 days old. That's it! I'm interested in your belly+baby special. Will I be getting a digital copy of the photos at the end of each session or are they sold individually? If so, how much are the prints?